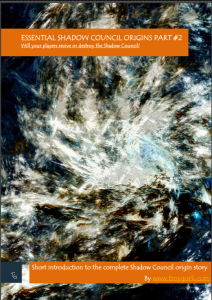 The Essential origins ebooks is a few introductory monologues by Tiny Gork where he shares the general history of the Shadow Council. They are a great start if you wanna aquaint yourself with the core story of the Shadow Council. in this issue Tiny Gork goes back to the beginning and talks about the creation of the council and how mistrust slowly creeped into it. He also explain briefly how they created their own worst enemy and how he planned to move against them. in this issue Tiny Gork continues his story about the councils nemesis and his plans for their doom. The Council tries to take pre-emptive actions, exploiting a possible weakness while the nemesis moves closer and closer to his end goal.